Facebook doesn't show you everything. There's a firehose of status updates and photos and poll questions and game results and news stories posted every day, and Facebook doesn't think you can handle it. A constantly tended algorithm — commonly known as EdgeRank, though Facebook has denied that anything with that name exists — chooses which lucky posts show up in your feed and which ones don't. Maybe that's for the best, maybe not — but there are ways you can have more control over what information you see. The most basic unit of Facebook control is the almighty Like. If you haven't Liked our page, you will almost never see any of our posts at all. Beyond that, you can Like indivual posts and even individual comments, and Facebook's algorithm takes all of that into consideration. If you tend to Like posts with photos, Facebook may show you more photos. If you tend to Like posts from certain friends or businesses, you may get more from them. 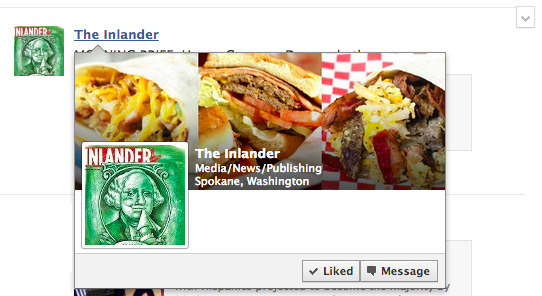 If you want to make sure you never miss a thing from The Inlander (or any other page you've Liked), Facebook has recently given you the option to Get Notifications. 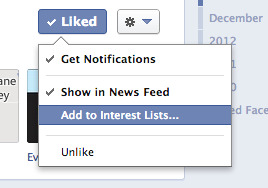 You can turn on this option by clicking the “Liked” button on any page. 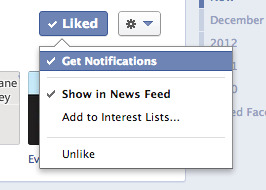 If you do this, Facebook will give you a little alert at the top of your page whenever something new shows up. Pros: You won’t miss much. Cons: It can be super annoying, especially if you follow any pages with frequent updates. 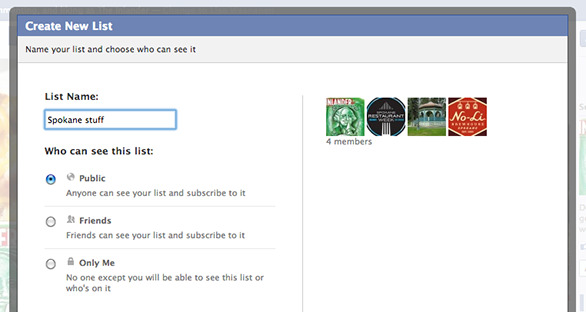 Chances are you don’t have any Interest Lists yet unless you’re a Facebook super-user, since it’s a pretty new feature. Basically, you choose Pages to show up in specialized mini-feeds. Say, for example, you make one for local Spokane stuff. You choose the Pages to include, and choose the privacy level. Now that mini-feed shows up in the left sidebar of your Facebook homepage, and you can see a greater number of posts that way. Pros: You can custom create any feed you want. For those of us who like to keep things organized, it can be nice to sort out the Pages you Like into nice little categories. Cons: A little bit of work to set up, and then you have to remember to check it. The low-effort version of interest lists is clicking on the default Pages Feed in your left sidebar. This just shows you posts from all the Pages you’ve Liked — and though it doesn’t show you all of them, it does show you more than show up in your regular News Feed. Pros: Easy. Shows you more. Cons: Doesn’t show you everything, and you still have to remember to check. This is so obvious we often don't think of it: Go straight to the Page and see all the updates there. What most people don’t know is that even when you go to a Page directly, the posts you see are still filtered sometimes. Click this subtle little button right above the posts to choose different options for what you see. Pros: Totally in your control. Cons: It’s easy to forget, and a pain if you follow lots of Pages. Finally, on the other hand, there are ways to get certain information out of your feed. (Except ads. You're stuck with those.) We really, really hope you will not do this with Inlander posts, but you can get options to hide content by hovering over any post and clicking the arrow box that appears at the top right. If you choose Hide, it will hide that post from your feed and then give you even more options about how often you want to see content from that person/page. There’s no need to unfriend that obnoxious person you sort-of knew in high school, just hide ’em. You’re welcome.